Our expert engineering team can help you turn your ideas or designs into the high-performance custom part you need. Just bring us whatever you have—whether it’s just a thought, a sketch, or even a full-fledged plan—and we’ll make the rest easy. Got the makings of a great design? The engineers at Storm Power will review what you have, and make recommendations on the processes, materials, and other key factors critical to the success of your electrical connectors and components. EST, SHIP THE SAME DAY! FREE Storm Power Components' product information, including product guides, ampacity tables, and more! Tin plated flexible braid connector with layered copper braid and two punched holes on each connecting tin plated pad. The BD series layered flex braid connector has the lowest current capacity and smallest dimensions compared to the other series. This is ideal for low power transformers and applications. The flexbraid connector offers a unique advantage of high ampacity and dynamic movement isolation. Which means it offsets bus systems to provide high efficient conductivity and minimal resistance. The flexibility of copper flexbraid also compensates to tight bends, vibration, expansion and contraction. As a compensator, the electrical connections always have full contact and do not need to be tightened or replaced because of external forces. 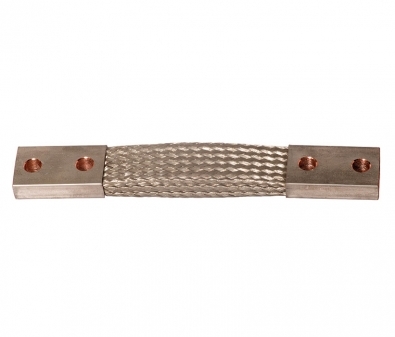 Flexbraid connectors are cold pressed at each end to form a strong uniform bond, with rounded ferrules to prevent chafing.